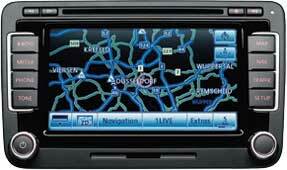 VAG Group vehicles, that would be either an Audi, Seat, Skoda or Volkswagen (VW), which are fitted with the RNS510 / RNS810 MFD3 Multi Functional Display Satellite Navigation System are experiencing major problems with the satnav display units. They’re pretty cool, look great in the dash but at £2000+ they don’t come cheap! We are getting units sent in on a daily basis for all sorts of problems. From complete screen failures to Navigational Functions not working – which is common across the entire VAG Group MFD3 Multi Function Display Satellite Navigation System range. When they fail, dealers render the entire unit useless and advise that it must be replaced – if it’s replaced under warranty then you’re very lucky but otherwise it seems like a very costly replacement which is where we come in. Before parting with your hard earned cash, there is a very good chance that your existing unit can be repaired saving you a LOT of money. We offer a specialist repair service whereby we’ll remanufacture your existing unit in as little as 3 days and return it to you with a Lifetime warranty. Repaired units are fully Plug & Play meaning no programming will be required. All units are first tested on our purpose built testing equipment which can simulate the unit as if it were still on the vehicle. We test all units to confirm the faults you are experiencing and to check for any other underlying problems the unit might have. We then go on to remanufacture the unit, replacing major components such as processors and Liquid Crystal Displays (LCD’s) where necessary before re-assembling the unit. All repaired units are then re-tested to confirm full functionality of the unit before returning it to you with a Lifetime warranty. No programming is required when you get the unit back, simply plug & play! There are various different models of the Multi Function Display (MFD3) Satellite Navigation System and even if you’re driving a different vehicle with similar issues, it’s possible that we can still help you. If you’ve got an issue with your RNS510 / RNS810 MFD3 Multi Function Display Satellite Navigation Unit, then before purchasing a new unit give us a call and see how we can help you today. Tags : 1T0 035 680, 1T0035680, 1Z0 035 680, 3C0 035 680, 3T0 035 680, 5P0 035 680, 7E0 035 680, 7F0 035 680, 7L6 035 680. My RNS 510 is working fine but the audio and nav info on the MFD is not displaying and the steering wheel buttons for changing the channel on the radio do not work. We have the facilities to fully bench test & remanufacture the RNS510 MFD units. I have sent you an email with full information and pricing. If you have any questions, please reply to the email and we’ll be happy to assist you.